Prof. Hall is a faculty member in the Thermal/Fluids Systems program in the Walker Department of Mechanical Engineering and holds the Louis T. Yule Fellowship in Engineering. His research focus is engine combustion processes with an emphasis on optical measurement techniques and engine sensor development. 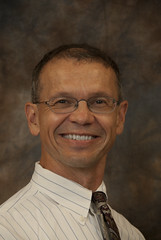 He has served on the College of Engineering faculty since 1991 and has published more than 100 technical articles. He received the Myers Award from the Society of Automotive Engineering in 1998 for the outstanding paper co-authored with a student. Dr. Hall and co-author received the Horning Award (1987) from the Society of Automotive Engineers for the best paper of the year in the area of engines, fuels, and lubricants, and an Arch T. Colwell Merit Award (1985) for outstanding paper from the Society of Automotive Engineers. Dr. Hall received an Engineering Foundation Faculty Excellence Award in 1995 in recognition of his teaching accomplishments. He was elected a Fellow of the Society of Automotive Engineers in 2010. Dr. Hall received B.S. and M.S. degrees in Mechanical Engineering from the University of Wisconsin, and his Ph.D. in Mechanical and Aerospace Engineering from Princeton University. He held post-doctoral positions at Sandia National Laboratories' Combustion Research Facility and the University of California-Berkeley. Ozel, T., Hall, M.J., and Matthews, R.D., “Increasing Exhaust Temperature of an Idling Light-Duty Diesel Engine through Post-Injection and Intake Throttling,” Society of Automotive Engineers Paper 2018-01-0223, 2018. Koeroghlian, M.M., Hall, M.J, and Matthews, R.D., “Calculating a Viscosity Correction for Humid Air in a Laminar Flow Element,” Society of Automotive Engineers Paper 2018-01-0206, 2018. Ates, M., Matthews, R.D., and Hall, M.J., “A Full-Cycle Multi-Zone Quasi-Dimensional Direct Injection Diesel Engine Model Based on a Conceptual Model Developed from Imaging Experiments,” Society of Automotive Engineers paper 2017-01-0537, 2017. Brito, F.P., Figueiredo, L., Rocha, L.A., Cruz, A.P., Goncalves, L.M., Martins, J., and Hall, M.J. “Analysis of the Effect of Module Thickness Reduction on Thermoelectric Generator Output,” J. of Electronic Materials, 45 (3), pp 1711-1729 DOI: 10.1007/s11664-015-4182-x, 2016. Brito, F.P., Alves, A., Pires, J., Martins, L., Martins, J., Oliveira, J., Teixeira, J.C., Goncalves, L., and Hall, M.J. “Analysis of a Temperature Controlled Exhaust Thermoelectric Generator during a Driving Cycle,” J. of Electronic Materials, 45(3), 1846-1870, Springer, 2016, DOI: 10.1007/s11664-015-4258-7. Allouache, A., Leggett, S., Hall, M.J., Tu, M., Baker, C., and Fateh, H. "Simulation of Organic Rankine Cycle Power Generation with Exhaust Heat Recovery from a 15 liter Diesel Engine," Society of Automotive Engineers Paper 2015-01-0339, and SAE Int. J. Mater. Manf. 8(2), doi: 10.4271/2015-01-0339, 2015. Hall, M.J. “Effects of breech bolt movement on felt recoil of a gas-operated semi-automatic sporting gun,” Proceedings of the Institution of Mechanical Engineers, Part P: Journal of Sports Engineering and Technology, September 2015, Vol. 229 (3), pp. 159-168, 2015. Baker, C. A., Emiroglu, A., Mallick, R., Ezekoye, O.A., Shi, L., and Hall, M.J. “Development of an analytical design tool for monolithic emission control catalysts and application to nano-textured substrate system,” Journal of Thermal Sci. and Engr. Appl., Vol. 6, No. 3, 031014 2014. Fateh, H., Baker, C.A., Hall, M.J., Shi, L. “High fidelity finite difference model for exploring multi-parameter thermoelectric generator design space,” Applied Energy, Vol. 129, No. 15, pp. 373-383, 2014. Valentino, R., Hall, M.J., and Briggs, T. “Simulation of Organic Rankine Cycle Electric Power Generation from Light-Duty Spark Ignition and Diesel Engine Exhaust Flows,” Society of Automotive Engineers Paper 2013-01-1644, 2013, also in SAE Int. J. Engines 6(2):2013. Rostedt, M.G., Hall, M.J., Shi, L., and Matthews, R.D. “Spark Breakdown Voltage and Surface Degradation of Multiwalled Carbon Nanotube Electrode Surfaces,” International Journal of Mechanical, Industrial Science and Engineering, Vol. 7, No.2, pp. 1115-1120, 2013.